Please refer to our stock # GenrePtg when inquiring. This large and busy late 19th Century American folk art genre painting is oil on cotton screen laid down on muslin, on a lattice wood frame. 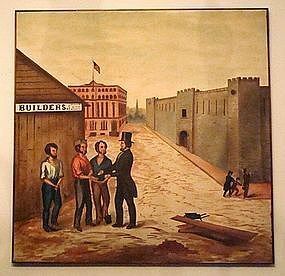 Against the backdrop of a fantasy image of a Philadelphia street-scape is the depiction of three unemployed men receiving money from a man in a coat and top hat, a young man caught in the act of pickpocketing, in front of a builder's shop, a federal building and a prison, possibly Fair-mount Prison in Philadelphia. Dimensions are 48 x 48.5 inches. This is a very folksy painting that makes a big statement on the wall. You can now buy this painting with Art Money, a service we offer our most valued clients. Art Money will give you a 10 month, interest free loan of up to $50,000 so you can buy the art you love.